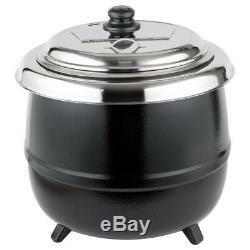 Round Countertop Black Food / Soup Kettle Warmer 110V, 600W. 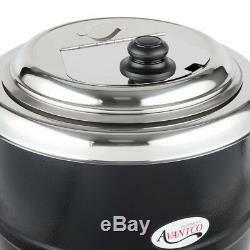 Keep soups and sauces at the perfect serving temperature with this Avantco S600 14 qt. Holds food at safe temperatures. Black exterior for professional appearance. 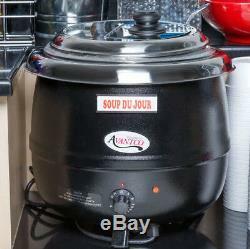 This Avantco soup kettle warmer is an excellent addition to any restaurant, catering service, or buffet line that needs to hold soup, gravies, stews, or nacho cheese at food-safe serving temperatures. Its simple manual control knob allows you to hold product at temperatures from 105-195 degrees Fahrenheit, while its stainless steel construction with bold black coloring is durable, attractive, and a breeze to clean. It also features a notch so you don't need a separate space to keep the ladle when not in use. Just leave it in the warmer and the lid closes around it, trapping the heat inside! 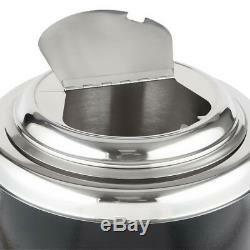 The removable hinged lid, ring, and a 14 qt. Aluminum inset help to make cleaning as easy as possible. Manual control knob makes temperature adjustment easy. The higher the number, the higher the temperature! 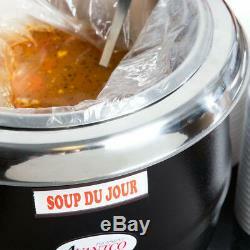 Magnetic labels for some of the most popular soups and stews means no more lost or broken tabletop signs. 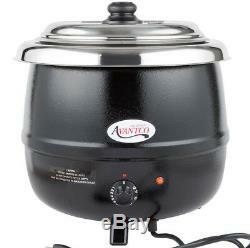 The item "Avantco 14 Qt Black Electric Food Soup Kettle Warmer Commercial Restaurant NEW" is in sale since Tuesday, November 14, 2017. 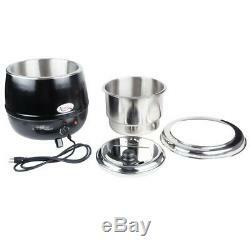 This item is in the category "Business & Industrial\Restaurant & Food Service\Commercial Kitchen Equipment\Cooking & Warming Equipment\Soup & Steam Kettles". 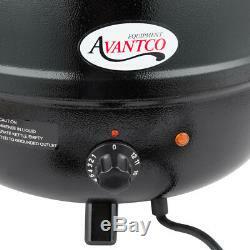 The seller is "factory_direct_online" and is located in Madisonville, Kentucky. This item can be shipped to United States.